If you’re a proud HiLux owner that wants to take it for a ride off the beaten track, then you might want to consider something important before doing so – giving it an extra lift. Even though the HiLux performs well under almost any given circumstance, and it’s one of the toughest and most reliable 4×4 drives ever to be made, it still isn’t high off the ground enough to avoid damages to its underside in rough terrains. Finding a lift kit HiLux is relatively easy nowadays, given its popularity in the Australian market. However, worth knowing is that not every lift kit HiLux is made the same, so it’s essential you do some research before ordering yours. In this article, I’ll talk about the 3 different types of lift kits – leveling, suspension and body lift kit, and how to make the right decision for your HiLux. These kits lift the HiLux’ suspension in order to give you more clearance. They achieve that by taking the front and back leaf springs and replacing them to lift the HiLux by 10 to 15cm. This can also result in improved handling and they are typically accompanied by CV spacers, crossmembers, lower skid plate, sway-bar drop bracelets, upper strut spacers, CV spacers and lifted knuckles. Suspension lift kits are some of the more complex lift kits and you should ask for help from an experienced installer. A HiLux body lift kit will lift your vehicle’s body for about 2 to 7cm from the chassis. This is the most popular option among off-road enthusiasts because you can typically also install larger tyres, because the lift will raise the wheel well. You get more clearance, but the main benefit is getting a larger wheel well. 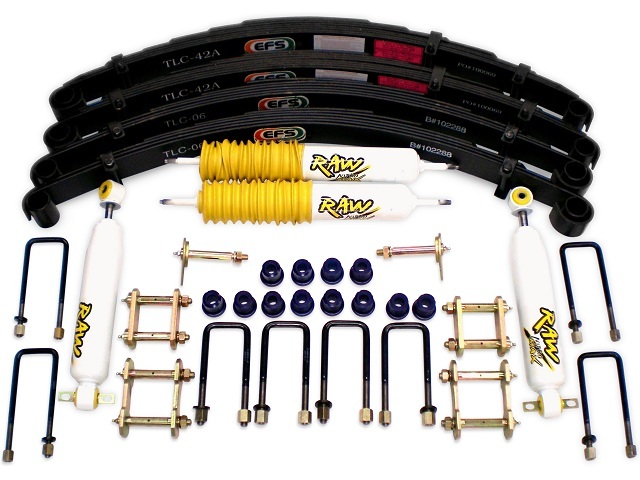 Typical body lift kits include body spacers, strap brackets and they might include front and rear bumper brackets. Leveling HiLux lift kits make up for the fact that some HiLux models are a few inches higher at the back. They’re not designed to lift the entire body, just level the front so it’s even with the rear. These kits are typically the most affordable and can be installed with lower strut mount extensions. Bottom line is, your HiLux can greatly benefit from a lift kit when you take it off the beaten trail. However, worth knowing is – if your HiLux still has a warranty, lifting it may void the warranty. So it’s best you check whether or not you still have warranty and then decide whether you still want to go with it or not.